This utility PCB and Front Panel provides EuroSynth users with access to either 4 or 8 sliders on a single pcb. The board provides connections for each slider allowing for the sliders to be wired in-series with circuits (such as in the feedback path of an op-amp) or to be connected to differing reference voltages. 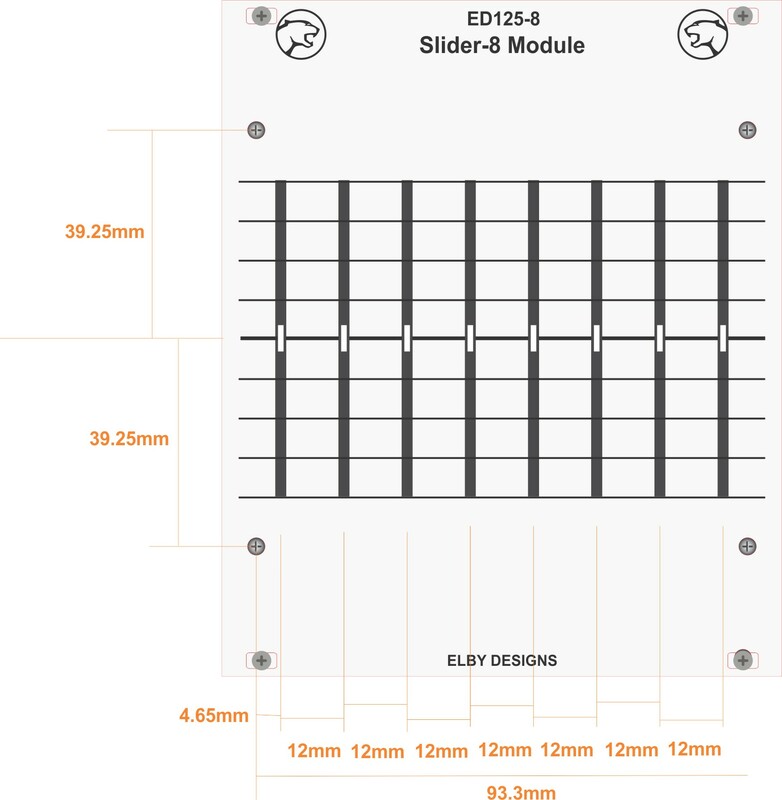 Alternately, any number of the sliders can be connected to 2 common bus rails allowing the sliders to share common upper and lower reference levels and so reducing off-board wiring. The panels below are examples of how the boards fit behind a 20HP EuroSynth panel. The left hand panel is using the Bourns PTE family of 60mm sliders while the right hand panel is using the ALPHA 312-619BF family of 60mm sliders. The board is attached to the front panel using 4 fixing screws and can be stacked horizontally for larger slider banks. Obviously the board can also be used in larger format systems or custom applications where you simply need to simplify the wiring for a bank of sliders. Typical uses include filters, equalisers and sequencers. Connections can be hard-wired directly to the board or be terminated using either 0.1" pitch crimp connectors, such as the Molex KK range, or 2.54mm screw terminals such as provided by Phoenix Connectors. 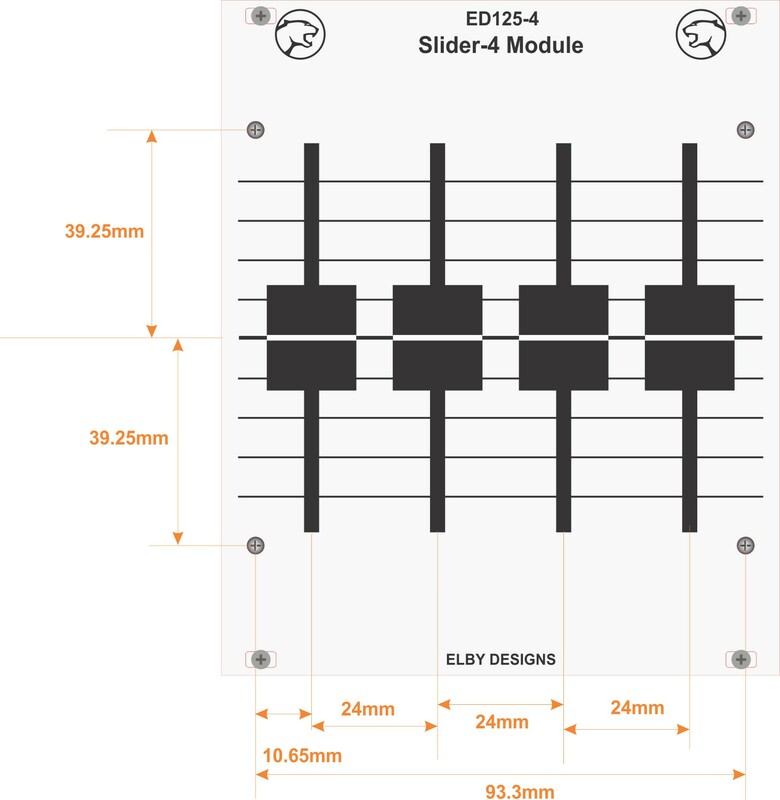 For the 4-slider version we recommend using the Bourns PTE60 familty of sliders. For the 8-slider version we recommend using the Alpha 312-619BF family. Of course other sliders may be used but they will need to have the same mechanical specification as for the recommended types. It is not possible to mix types on a single pcb.